Everyone is welcome to come and receive the loving, healing energy of Reiki. Imagine starting your week and month lying down on a yoga mat inside the comforting and sacred space created by Alexandre and our Light Worker friends, enveloped by the healing energy of Reiki as you listen to beautiful songs and music from different genres and eras carefully and lovingly selected by Alexandre for this special gathering. You will also be immersed in the sounds and vibrations from Tibetan and Crystal Singing Bowls, Native and Spirit Drums, Koshi Chimes, and Native Flutes. 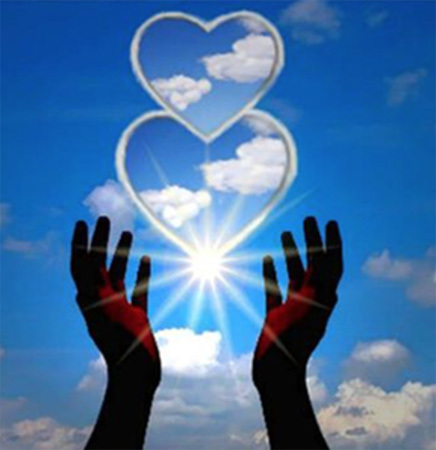 You will receive nothing but Healing Reiki Energy and Unconditional Love. You will find yourself in a sacred space where the monkey mind finally stops; a time created just for YOU to recharge your mind, body and spirit, filling the reservoir of your Heart with unconditional love and acceptance for the Infinite Being that YOU Truly Are. Bring yourself and a whole lot of love! Note: February 4 and June 3, 2019 are both new moons. This event typically has a waitlist. If, after registering, you become aware that you cannot attend, please contact the Den as soon as possible. This gives us notice to be able to offer your space to those on our waitlist, as well as enabling us to appropriately set up the space in our Great Room. Payment is by donation ($10). All proceeds are split between Mary and Alexandre's favourite charities, The Oakville & Milton Humane Society and The Dog Rescuers. Please review the Registration / Payment / Cancelation information in the main page. Yoga mats are provided. We also have blankets & pillows, although not always enough for these gatherings. We suggest you bring your own, plus a yoga mat or comforter for extra padding, if you like.